Written on February 13, 2012 at 11:31 pm by Air Coole VW Love! For the Beetle 1967 was “one year only” in many ways and even more so for the convertible. I have been doing quite a bit of reading and researching to learn more about this particular car. I have learned that the 1967 was an unusual year in that there are many 1967 “only” parts and accessories. I learned that the passenger side front fender is not an original although the driver side fender is. I haven’t found out for certain about the bumpers but the rear deck lid is original – and very rare I have been told. The thing you see attached to the underside of the deck lid in the photo is a rain catcher. Notice the drain hoses on either side of the rain catcher which directs rain water away from the engine. I have been an air cooled VW enthusiast (fanatic actually) all my life and had never seen a deck lid like this before. The seats that were included; a back seat and a passenger seat – are not 1967s and will not fit. A driver side seat was not included… this means that I have no seats and since only 1967 seats will fit I am going to have a time with that. The weather has been cold and I have been busy with work and other things so I haven’t done much with it yet. But spring is in the air and well on its way. I don’t plan to restore this car to full original and mint condition of course, and maybe I will not aim for a completely original “all ’67” seeing as how I am on a tight budget but perhaps over time I will get this thing closer and closer to that state. I received my copy of John Muir’s Book How to Keep Your Volkswagen Alive and am now awaiting the delivery of my Bentley Manual for 1966,1967,1968, and 1969 years. Both are required materials. The place where I have learned the most about the 1967s unique needs was in the “School me on the 1967 one year only stuff” thread on the Samba forum. That forum is a great place to learn more about these critters. i have a 1600 vw motor on my dune buggy and just cant seem to get it to run worth a crap..ive got new plugs, wires, cap, rotor, points, coil, rebuilt the 34 pict-3 carb according to specs, set the jets, adjusted the valves to .006″, and set timing according to test light procedure as i cant set the high rpm timing because it wont run right..acts like its flooding out or running on 2 cylinders…compression is correct on all 4 cylinders…any thoughts?.. If you still have the 009 distributor, have it checked out as they’re a b@st@rd to set if they’re faulty. Also, the replacement condensor that are sold now-a-adays do not work with the older distributors, I had to replace mine with my old busted condensor and only then did my motor run fine. 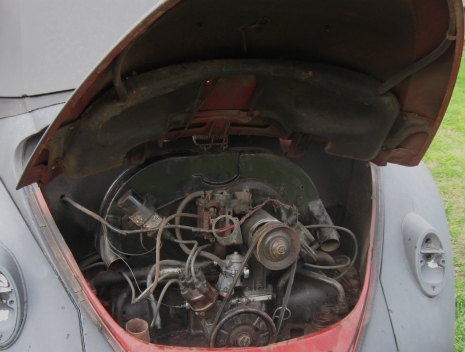 I did though have a Solex 30 PICT1 carb though.